I've been dreaming of Spring a lot since last weekend was +10 here in Montreal. I'm so over winter but don't tell my ice-loving hubby and kids, because they're crying over the melted outdoor rinks and I'm trying to be sympathetic but.... SPRINGGGGGGGGGGGGG! All winter long I've been waiting to bust out my new trench coat and these sweet kicks that just scream Spring to me. Shoes with no socks and a light jacket is more than enough for me. I'm not hankering for the sweaty days of summer when you have to avoid peak hours and slather SPF on every surface of your bod before leaving the house. No, Spring and Fall are where it's at, and I'm so ready! 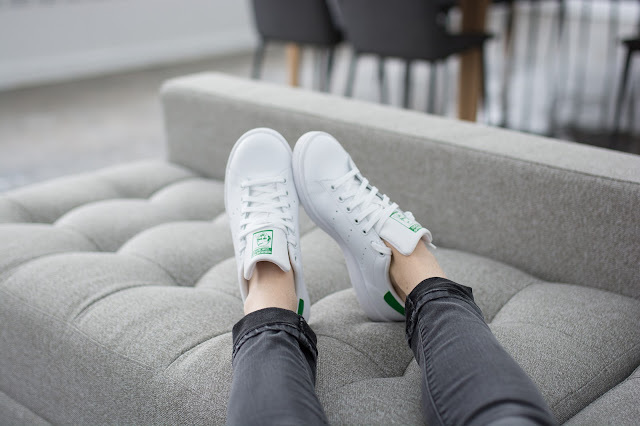 I'm obsessed with the Stan Smith Adidas from Altitude Sports. I like the classic three stripe Adidas too, but these are a bit more trendy and a bit less sporty in my mind, which is exactly what I was hoping for. I love shopping Altitude because they're not just Canadian but also Montreal-based. Their prices are the same or better than the every big store that sells outdoor and active gear, but shopping local and Canadian is important to me, so yay! This post is in Collaboration with Adidas and Altitude Sports. All opinions are 100% my own. To book a collab, see HERE. Last photo by Rachel Cheng Photography.